It’s easier to sell what no one else does – but harder to make a sale when you haven’t got what everyone else has. Subaru is the only car company that sells only AWD cars (well, with one exception – the rear-drive BRZ sports car) and not just that, but AWD-equipped cars that are powered by low-mounted, horizontally-opposed “boxer” engines instead of the usual upright, inline and V-type engines everyone else sells. Not just some of them – all of them. 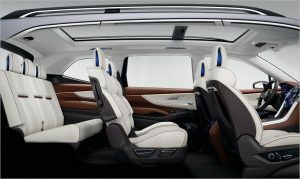 But the one thing Subaru lacked that almost everyone else already has is a full-size crossover SUV with three usable rows and room for eight full-size people. 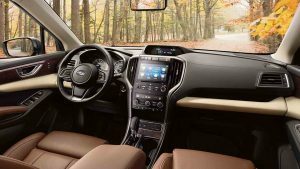 Now Subaru does – and unlike the ones sold by everyone else, the new Ascent comes standard with both AWD and the horizontally-opposed boxer engine, the former available (at extra cost) in the others and the latter not available at all (at any cost). 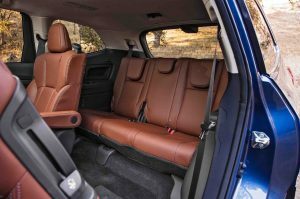 The Ascent is a full-size, three-row and 7-8 passenger (depending on the configuration) crossover SUV. 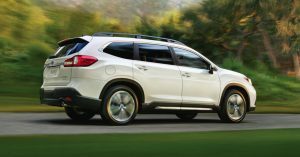 Subaru has had a three-row crossover in its lineup before – the Tribeca – but its third row was cosmetic, for appearances only. The Ascent is adult-friendly in any of its three rows. It is not quite as big on the outside as some of its main rivals, including the Mazda CX9 – but it turns out that it has more room inside than the Mazda does – and not just in its third row. It also has more cargo room behind its third row – and with its second and third row folded down. 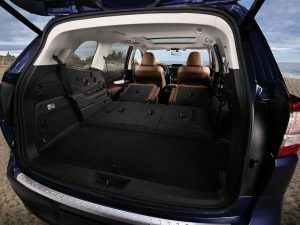 It even has more room for people and cargo than the Honda Pilot – the former king of space efficiency. The Pilot does come standard with a V6 engine, though – another type of engine that’s getting hard to find in crossovers of any size, even the super-sized ones. The Ascent stickers for $31,995 to start – which includes standard AWD and a turbocharged 2.5 liter boxer four to go with it. Rivals like the CX-9 and Pilot come standard with FWD; AWD is available optionally. 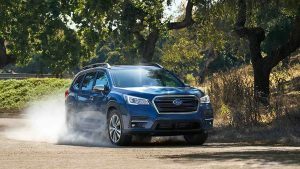 The Ascent is a new model for Subaru and the first truly full-sized Subaru the company has ever sold. Best-in-class third row legroom (32 inches). More cargo room than rivals. Turbocharged engine is undersized and hungry; wants premium fuel. Second row seat tracks are dirt traps. Subaru – like other car companies – finds itself between a rock and hard place. Buyers want bigger vehicles and expect them to be able to move, despite being big. The Ascent is both big – and very heavy. Almost 4,500 lbs. before the driver even opens the door. Normally, this kind of weight in a vehicle this big would call for a big engine to match. A V6 engine at the least – which is what vehicles this size used to come standard with. But we live in abnormal times. The government wants – demands – fuel-sippier cars, no matter how little the people actually buying the cars care about that. So, on the one hand, even really big vehicles like the Ascent – and several of its same-sized rivals, including the Mazda CX-9 – now come standard (and only) with very small four cylinder engines. But these very small engines aren’t big enough – by themselves – to get such big and heavy vehicles moving adequately. 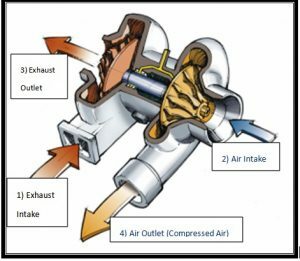 Which is why turbochargers are added to make them adequately powerful on demand. Today, it’s government fuel efficiency mandates that are high – at the same time that gasoline is cheap. 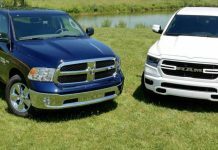 There is no market incentive for small engines and lots of market demand for big and powerful vehicles. V6s and even V8s would make more sense in such vehicles but the car companies have to cater to the government at least as much as they do customers. So, that’s why the biggest and heaviest-ever Subaru has an engine not much larger than the engines used in the smallest and lightest Subarus. Just 2.4 liters – only slightly larger than the 2.0 liter four used in the Impreza and BRZ sports car – the latter of which weighs about half what the Ascent does. But, it is turbocharged – which boosts the output of the little four on demand (when under boost) to about what a 3.5 liters-or-so V6 without a turbo would make: 260 horsepower and 277 ft.-lbs. of torque. 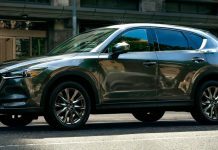 This is similar in them – but stronger in horsepower output – to the Mazda CX9’s 2.5 liter and also turbocharged four cylinder engine, which makes 225 hp but also 310 ft.-lbs. of torque, which is a lot more torque than the Soobie’s four. On the other hand, there’s the Honda Pilot – which has a V6 without a turbo that makes more horsepower (280) than either, but less torque (262 ft.-lbs.) than both of them. And here we come to the main real-world advantage of these turbocharged fours – which isn’t fuel economy. It is superior (and sooner) torque production. The turbocharged fours swell with motive force at lower engine RPM (more on this below) as the turbos come online. Note that the Pilot’s V6 not only makes less torque, it doesn’t make its peak torque until the engine is spinning 4,700 RPM. The Soobie’s – and the Mazda’s – turbo fours make their peak torque at about half that engine speed. But gas mileage is at best a draw. The Ascent – with AWD standard – rates 20 city, 27 highway. The AWD-equipped (optionally) Mazda CX9 posts 20/26. The V6/AWD-equipped Pilot comes in at 18 city, 26 highway – a difference without much distinction. A difference with a distinction is the Ascent’s uniquely configured (well, other than Porsche) boxer engine layout. The cylinders are laid flat rather than upright, which gets the weight down low. The cylinders are also opposed rather than in-line, which naturally and internally balances the engine as the pistons box each other across the crankshaft rather than all of them pushing it down and pulling it back up. So no need for a heavy external balancer to tamp down engine vibrations. Though this is the biggest and heaviest Subaru ever, it is designed to not feel like it is. 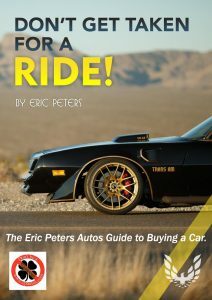 The hood slopes down and away – and the steering is very quick. As in most Subarus, you sit higher up and so does the Ascent itself. It has 1.5 inches more ground clearance (8.7 inches) than the Pilot (7.3 inches) but – somewhat surprisingly – slightly less than than the Mazda CX9 (8.8 inches). 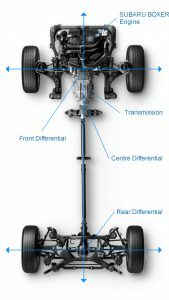 The Ascent’s standard AWD (optional in the Mazda) is more sophisticated – capable of vectoring torque to individual wheels, rather than pairs of wheels (i.e., the inside right rear wheel rather than both rear wheels). This is a trick it learned from its WRX cousin. Also, the low-mounted boxer engine – unavailable in the Mazda or the Honda or anything else – helps with stability during cornering. Everyday driving-wise, there’s no denying the torque advantage of these turbocharged fours. They may be smaller than the non-turbo’d V6s they are replacing – and down on horsepower. 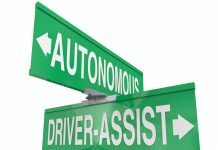 But when you’re pulling out of your driveway or trying to nudge your way through traffic, not having to floor the accelerator pedal – or even halfway floor it – is inarguably pleasant. And that pleasantness is a function of the torque enhancement of the turbocharger. This engine does its best work below 4,000 RPM. It is rarely necessary to rev it past that. Of course, a turbo V6 would enhance things even more pleasantly. But Uncle would get really mad, stomp his feet and probably indict someone for wasting the earth’s precious bodily fluids. 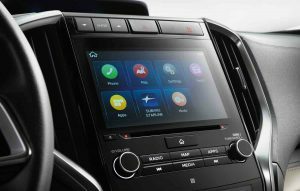 The Ascent – like other Subarus – uses a continuously variable (CVT) automatic rather than a traditional automatic, as in the CX9 and others. The CVT hasn’t got the usual planetary gearset and fixed number of forward speeds (e.g., six or seven or eight or nine) but instead what amounts to infinite/constantly adjusting gear ratios, with the idea being to keep the engine operating at just the right speed (RPM) at all times, for maximum mileage potential. CVTs are coming into general use for the same reason that small/turbocharged-to-make-up-for-their-smallness engines are coming into general use. To squeeze out an MPG here or maybe over there. 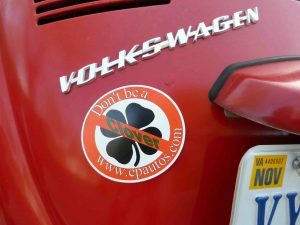 In order to appease the fuel economy fatwa-issuers in DC. And like the turbo’d engines – which are heavily boosted to make-up power lost to their smallness, at the expense of fuel economy – the car companies have had to compromise the efficiency potential of CVTs – by making them shift more like traditional automatics, in order to keep customers happy. Thus, the Ascent’s CVT seems to shift through 7-8 fixed forward speeds, just like a conventional automatic – because most buyers don’t like the turbine-like feel (and sound) of “shiftless” CVT operation. Crossovering is a question of packaging more than anything else. What to emphasize? Room for people – or cargo? How much of each? 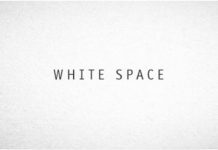 And how much of each given the space available? There is a lot of space available in the Ascent. It is nearly 17 feet long overall (196.8 inches). So there is a lot of room to work with. 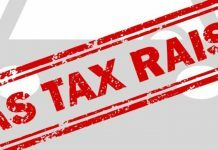 The question is – how to allocate it? The designers of this thing didn’t compromise any of the essential categories – most notably, the third row. It has 32 inches of legroom, more than most – and adult viable headroom, too. 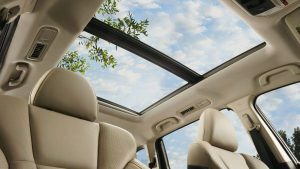 Even with the available panorama sunroof, which extends from the first row all the way to the third row. But there is also best-in-class cargo room, too – and in both categories. Behind the third row, 17.8 cubic feet (significantly more than the CX9’s 14.4 cubic feet) and more than even the ex-king of space efficiency Pilot’s 16.5 cubic feet. 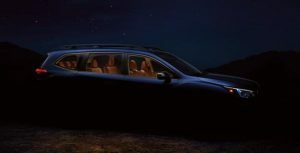 The Ascent also has more total cargo capacity – 86.5 cubic feet vs. 83.8 in the Pilot and just 71.2 in the longer overall Mazda. The exterior styling is generically handsome but it’s the details which are pretty. For example, the four AC vents built into the headliner, including a pair set back far enough to vent air to the third row occupants – who also get USB/device charging points, too. And the rear doors which open almost perpendicularly – to open up access to the second (and third) rows. There is also a wide-angle/drop-down accessory rearview mirror – to keep track of the kids in back without having to use (or readjust) the main rearview mirror. There’s also an available forward camera which pipes images of the road ahead through an LCD screen in the top of the dashboard. That’s not new. What is new is that the Subaru’s view doesn’t shut off once the car is moving at more than a crawl. Most if not all of the others do. This one, you can turn on at any time – and at any speed. The door-mounted controls for the power windows are canted slightly downward – toward the driver, which makes using the power window controls more comfortable. The dash has an open storage shelf built into it – which isn’t a new idea, either. What is new is the way Subaru designed it. 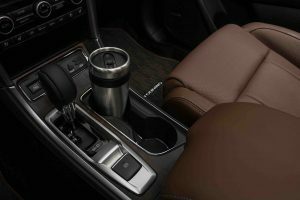 It rolls forward just slightly – and there’s a slight lip at the forward edge – just enough of both to keep whatever small items placed there from jostling loose and onto the floor (or under the seat) as you drive. 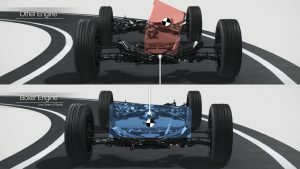 Subaru’s EyeSight (so called because the cameras are mounted at eye-level, not in the car’s lower bumper as is general practice) is standard in all trims. It bundles adaptive cruise control, lane departure warning and automated emergency braking. You can also choose either seven or eight passenger seating, with the former offering larger and plusher individual captain’s chairs rather than the more utilitarian three-across type. I found one nit to pick with the Ascent: If you slide the second row seats forward, you will discover the tracks in the floor are recessed into the floor and exposed. There is no shield or cover to prevent the inevitable dirt and kid debris from accumulating in the tracks and gumming up the works. Also: The Ascent’s engine is a premium fuel engine. Not required – but recommended. That means you can use regular 87 octane unleaded and not hurt anything – other than the maximum power produced by the engine. If the computer senses other-than-premium, it dials back the power just a bit to accommodate the lower-test fuel. 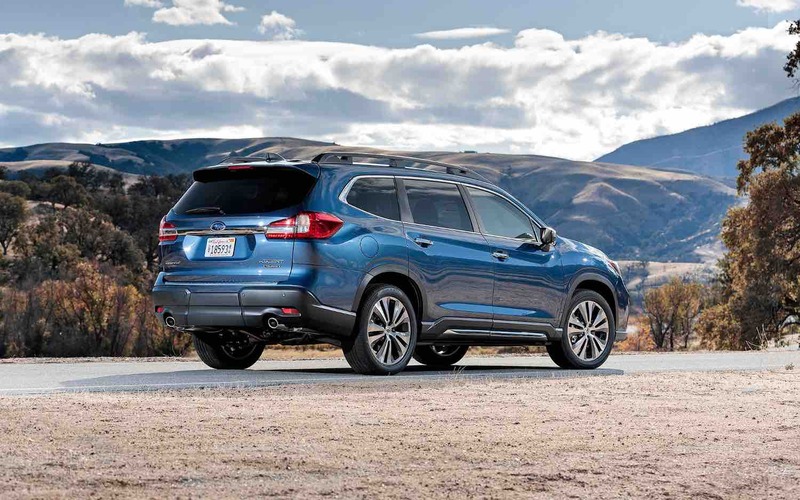 The Ascent gives Subaru what was lacking – packaged with what others aren’t offering. Odds are it will sell. Been extremely happy with our Forester XT but we’re about to outgrow it and the Ascent is looking good. Big wagon with a 4 cyl is nothing new, Peugeot 404 and Volvo 240 wagons in the family past went just fine. When I see dumbass things like making a CVT shift sequentially, though, it makes my eyes cross. And there is the same old problem of having to buy features you don’t want in order to get the ones you do want. I, too, worry about the reliability of Subarus beyond 100k miles. It seems that if they make it much past that without issues, they tend to be pretty solid. The main issue, as has been mentioned, is head gasket failure. This is particularly problematic in a boxer engine due to having two head gaskets yet only 4 cylinders. One of the most common preventative maintenance practices on boxer engines is preemptive head gasket replacement around 90k miles before the engine is damaged. This single service, which isn’t cheap (but cheaper than a full repair after they fail), can often buy you another 200k miles or more on the engine, from what I understand. From a mechanic friend of mine, it seems that this known issue is one that has been mitigated, if not resolved, in the latest Subaru engines, but the fact that it was a well-known issue for so long and yet was not addressed does worry me. 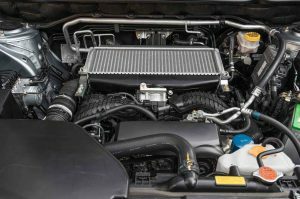 In fact, one of the apparent fixes for the older engines is simply to use the head gaskets from the turbocharged versions of the 4-cylinder engines on even the non-turbo engines. They hold up better and are much less likely to fail. Thus it seems that, at least on older engines, it’s actually the turbocharged models that have better dependability, despite the additional complexity of turbos. Subaru has been building tough turbos for decades now, many of which are race-proven. So it’s not clear which argument holds in this case. 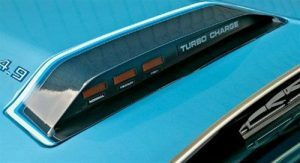 Turbocharging has been around since at least the 1980s, and it is mostly solidly worked out now. Much like fuel injectors used to be new tech and not as reliable (remember the old “fuelies”? ), they are now not only dependable, but generally easier to keep running than a carburetor is, and longer lasting. Time, and technology, marches forward. Despite this, all other things being equal, a non-turbo engine should generally be more reliable than a turbocharged smaller engine of similar output. This was, in fact, how Ford beat Ferrari at Le Mans with the legendary GT40. Ferrari and the other Europeans trended towards higher-strung, smaller displacement engines with more horsepower per cubic inch, whereas Ford made much larger, less stressed V8 engines that produced similar power but without nearly as much effort or stress on the internals. Thus they could run all day long in these endurance races like Le Mans and remain more reliable. At least that was the theory that Mr. Shelby had, and it was proven true year after year and podium after podium. I strongly suspect if the engine is reliable, this will be a huge win for Subaru. The most common complaint I have heard about Subaru from shoppers is their lack of a true mid-sized, three-row SUV to compete with the Pilot and the Highlander. 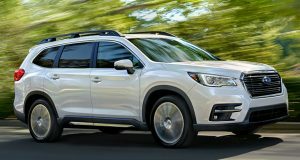 Subaru is on the rise already with the Forester and Outback both selling very well, but this was one gaping hole in their lineup. Now they not only have something competitive, unlike the old Tribeca which was too small, too underpowered, and too ugly for its own good, but they have something superior in many practical ways. For example, the rear doors open up almost perpendicular, much better than any other midsize SUV I’ve seen. When looking at a prototype of this with a friend who has a family, he commented on how critical this feature is both for accessing the third row, but even more so for accessing child seats in the second row. 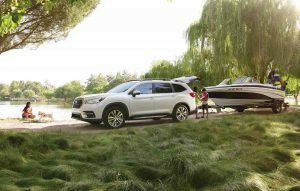 This alone can be a make-or-break feature, and the Ascent has both the Pilot and Highlander beat. Also the room behind the third row is noticeably larger than either Japanese competitor. Nearly everyone I know with a small family is eagerly awaiting the reviews on this new model and many are holding out on buying a Highlander or Pilot until this is reviewed. This is truly a midsize SUV, not a full-size, though it is on the larger end of the mid-size, 3-row crossover segment. The only larger midsize crossovers that comes to mind are the Nissan Pathfinder and the new VW Atlas, another SUV that has been getting rave reviews and may rescue VW (both are also, not coincidentally, under-engined for their size). 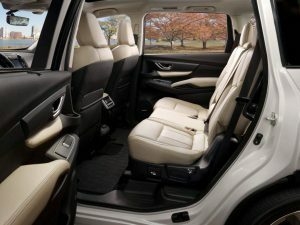 Externally, these new midsize crossovers are significantly smaller, lighter and more maneuverable than a Tahoe or Expedition or Armada (true full-size SUVs), but due to the packaging advantages of the unibody design, you get similar, or superior, interior volume to a body-on-frame full-size SUV. The whole segment continues to get larger, with market demand and market aversion to not-so-mini minivans, which perform most of the duties of crossover SUVs in far superior fashion, but without as much style. Looks count for a lot, and the Ascent is not offensive in design and, thankfully, lacks the pig nose snout of the Tribeca. It actually looks better than the Honda and Toyota competitors, though is still generic looking. The interior quality seemed well above, at least in materials and design, either Japanese competitor, too. 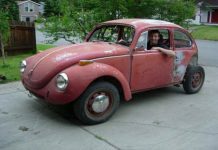 I didn’t drive it, as it was a prototype at an auto show, but turbocharged engines tend to have nice low-end grunt, and if the turbo-lag is minimal, they ought to be peppy in around-town driving, which will satisfy owners even if they are a bit gutless at highway speeds or fully loaded. Anyone remember the Tribeca, Suburu’s last attempt at an “upmarket” CUV? That’s right, it was discontinued. I predict a similar fate here. Suburu has a devout cult of followers. But they revere the brand for its unpretentious, frugal, durable, compact, affordable practicality. They excel as all-weather cars. Their homely but not ugly styling is part of their beloved image. Subie buyers simply aren’t attuned to big, 8 seat, more complex, costly conveyances, even if they’ve still got that “homely” thing going. Such cars are way out of the Subie wheelhouse. Icarus-like, this model is once again trying to “ascend” too close to the sun. History will repeat. My Subaru Outback has the 3.6 liter H6…With no turbo. I love love love this car. Everyone who’s owned one has told me that the H6, whether in 3.0 or 3.6 liter displacement, is the best choice for that car. My previous Outback and WRX had the four cylinder engines, and I sold the WRX before I had any turbo problems. I did have to have work done to replace bad head gaskets as part of a recall. Furthermore, the fours have a timing belt, which is a somewhat costly thing to replace, and when it breaks, will really mess up the engine. The sixes have timing chains. They pretty much last the life of the engine. That said, why, oh why, isn’t the H6 engine at least optional, fuel economy fatwas aside? Oh, I see…people might comparison shop the two…decide on the six like I did, and there goes your CAFE numbers. Subaru has had ongoing engine defects which they’ve been reluctant to admit or to make customers whole. Subaru’s bad attitude has resulted in three class action lawsuits. We have Subarus in abundance up here in The Woods – and my good friend who is a professional mechanic and runs his own shop owns them and repairs them for probably several dozen regular customers, at the least. I grant that this is anecdotal and your mileage may vary – but the Subarus (all types, recent and much older – including several ancient Brats) around here are revered for being sturdy, dependable and very long-lived. With that said, I personally would only buy one without the turbocharged engine. But that goes generally. I would never buy a turbocharged anything – for a daily driver. I have two soobs: an ’05 Outback (2.5L) and ’95 Legacy (2.2L). They have been pretty good cars. The ’05 had the head gaskets replaced at 76k miles. I bought 4yrs ago with 44k on the clock and turns out it was leaking then, I just didn’t know it. The 2.5L from 96-00, 00-05, and 05-09 all had head gasket problems. 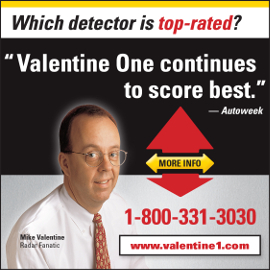 I can’t believe Subaru got away with that kind of sh#$^@^%t, especially in the Automotive Press. (If Chevy would have done something like that, they’d have been crucified…) Other then that (and for that repair I paid $2500) it has been a good car. Easy to work on. Simple. The H4 engine layout is nice, you can get at everything you need. All 4cyl Subaru engines are oil leakers though! 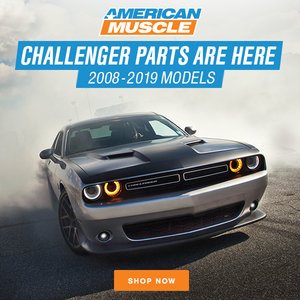 (Again, I can’t believe they get away with that kinda stuff…) Has to do with the layout, particularly the camshaft seals, since the camshafts have to punch thru the head in order to have the pulleys mounted on the ends of the camshafts. Also, the 2.5L is a “interference” design too, so you have to worry about that. With all that said the 2.2L in the ’95 has noooooonnnnnnneeeee of these issues! It is a fabulous engine! All the plusses mentioned above and none of the minuses. My ’95 is still chugging along after 4 teenagers and 228k miles. I would buy another Subaru, but prolly get the H6. But you can’t get the H6 w/o getting all the nanny-state safety crap Subaru puts on their higher end trims. Since I abhor the nanny-state safety crap more than any shortcomings of the current 2.5L engine, I’d therefore get a base model Outback. Funny, how the older I get I value “not getting what I don’t want” more than getting what I want! Defects: Head gaskets, excessive oil consumption, crankshaft/total engine failure. Seems the problems are with the 2.5-liter turbo boxer engine. 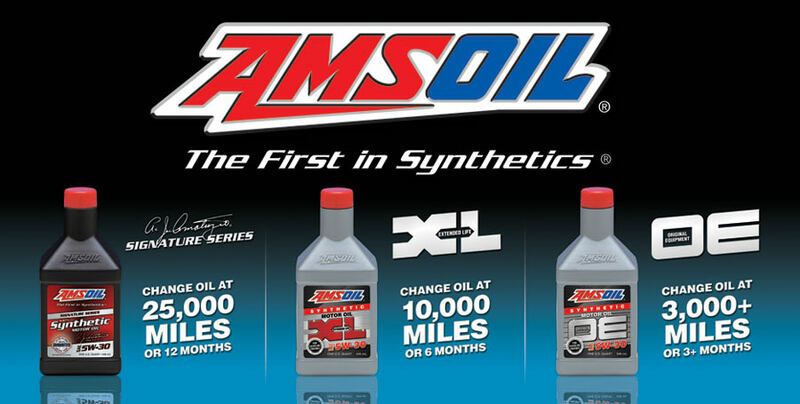 This may be why the Ascent has a new-design 2.4 liter engine…. I am looking into it….